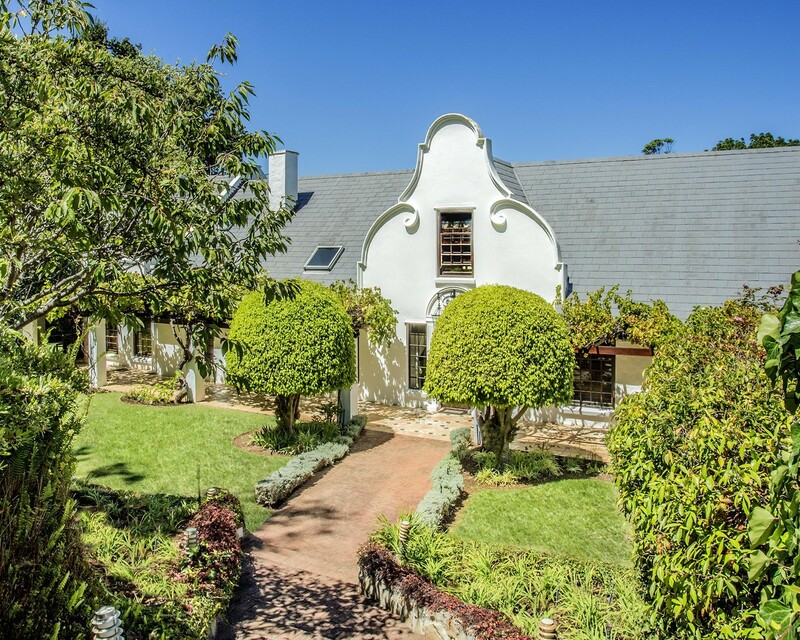 Situated in the uppermost avenues with superb mountain views. Magnificent gardens with forest like trees and meandering pathways take you to the front entrance, flanked by vine covered walkways. The elegant foyer will welcome you through to the formal lounge and dining rooms and the tv/family room. The charming thatched undercover patio is ideal for entertaining family and friends and enjoying the tranquil ambiance and vistas over the rolling lawns. The beautifully designed kitchen offers state-of- the art facilities, including a Smeg 6-hob for gas and electric cooking, twin ovens, microwave, granite countertop throughout with built-in dining/breakfast table to match, adjoining separate spacious scullery/laundry pantry. The ground floor bedroom wing consists of a main en-suite, 3 further bedrooms and a family bathroom. The upstairs level offers a luxurious master suite, with his and hers dressing rooms, plus an expansive studio / work from home space or play room. An independent full flatlet above the garage provides a lovely space for guests / Airbnb opportunity / teen pad. Staff accommodation, double garaging plus ample parking, an automatic generator, borehole with 10 000 litre tank and excellent security, complete this wonderful property. Delight in the Constantia outdoor lifestyle with gorgeous green belt strolls, cycles, mountain hikes, horse rides, Saturday Parkrun's, scenic drives to nearby beaches and magnificent surrounding wine farms include Buitenverwachting, Constantia Uitsig, Groot Constantia, Beau Constantia, Klein Constantia, Steenberg , Eagles Nest and world famous restaurants such as La Colombe and Chefs Warehouse. Easy access to Constantia Village Shopping Centre, Constantia Uitsig Bike Track, Virgin Active Gym and Constantia Sports Grounds - as well as top schools including Herzlia, The American International, Reddam House, Constantia pre-Primary and Constantia Waldorf.